Tearing down a wall and combining the kitchen with the dining room created an open an inviting meeting space. Utilizing the homeowner’s distinct and focused vision, as well as his already decided upon color scheme for the cabinetry, Homeowners Design Center was able to, “Help steer him in a direction for the upper and tall storage...” options, and paint each to match the lower kitchen cabinetry as well. “We brought in custom-painted door samples for him to choose from, and then he was able to go with what he wanted,” says Omoto. Click on the image below to listen to designer Jessica Omoto discuss the project with blogger Andy Beth Miller. Made from a high density fiberboard door that’s been painted (upper), and a thermo-structured laminate (lower), the cabinetry is aesthetically beautiful, with pale (and matching) soothing colors and a texture that looks uncannily like real wood, yet is actually a hearty laminate. The quartz countertops supply both non-porous and durable qualities, which keeps kitchen upkeep conveniently low-maintenance. 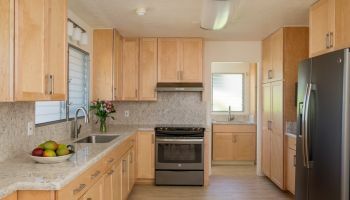 “We also added some kitchen cabinetry and storage that they could use either as a display area or for a buffet when they have get-togethers against the far back wall that used to be the dining area,” says Omoto. 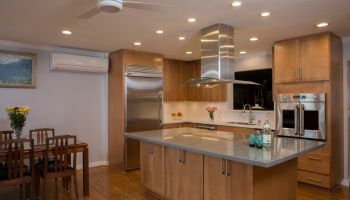 To see how Homeowners Design Center can help you with your kitchen remodel or home remodeling project, just click on the company name wherever you see it.